Environmental Protection Agency Administrator Scott Pruitt personally signed off on the pay raise of at least one employee through an obscure hiring authority under the Safe Drinking Water Act, while his chief of staff signed off on several others on his behalf, according to a new report. The report contradicts Pruitt’s previous claims that he was unaware of the raises. Pruitt personally approved the hiring of and subsequent title change for an employee in an “administratively determined” position, according to a “management alert” issued by EPA’s inspector general on Monday. The new role resulted in a 26.7 percent raise, or about a $21,000 bump. Six other employees received raises through the Safe Drinking Water Act, all of whom had their new salaries signed off on by Chief of Staff Ryan Jackson “for Scott Pruitt.” Pruitt personally authorized and signed for the initial hiring of three of those employees. Three employees were originally hired either by Pruitt or Jackson in “administratively determined” positions, converted Schedule C political appointees, and later converted back to AD roles. The total salary increases after those transitions ranged from 25 percent to 72 percent, or from $12,000 to $66,000. The other three employees went from AD to Schedule C to non-career Senior Executive Service positions. One of those employees received just a 1.6 percent raise in the process, though the other two received salary bumps of more than 20 percent each. The inspector general did not comment on the propriety of the raises, saying its work is ongoing and it simply wanted to notify Pruitt of “certain factual information while our audit continues.” The IG said it would continue to review other uses of the Safe Drinking Water Act for personnel changes under the current and previous administration. The auditors did not yet make any conclusions or recommendations. In a response provided to the IG on Sunday, EPA said Pruitt did not have any involvement in the decisions. 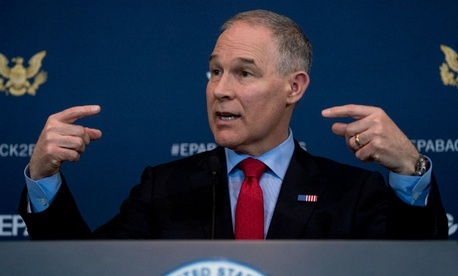 The Atlantic first reported that EPA issued the new positions and corresponding raises to Sarah Greenwalt, senior counsel to the administrator, and Millan Hupp, Pruitt’s scheduling director, after the White House initially rejected the proposals. Pruitt was subsequently pressed on Fox News to respond to the report, but denied any knowledge of the title changes. He said he had only became aware of the raises when they were reported in the media and he ordered their reversal. The IG probe is the latest in a series of potentially problematic developments for Pruitt. 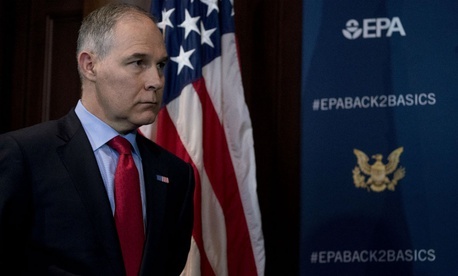 Earlier on Monday, the Government Accountability Office found EPA violated two laws when it installed a soundproof booth in the administrator’s office. House Oversight and Government Reform Committee Chairman Trey Gowdy, R-S.C., last week demanded information from EPA on both Pruitt’s first-class travel and on the rental agreement between the administrator and the wife of an energy lobbyist. Pruitt is also facing allegations that he has abused his position for unnecessary security details, even while not on official duty.